Students are free to pose questions and comments here and join in the conversation with other students. The thread will be monitored by the course program manager. Benn looking all over the INACHI POOL & SPA site for a Pool and Spa.s checklist of report to install on my HIP program..
That's exactly what I did Ben. Pasted the page and going to invent a report checklist on HIP.. Thanks Ben. Keep up the good work. Thought there was a formal example. Hey Ben, any chance of making a NACHI TV of Pool inspections course ? Jim did a pool last week on HORIZON. Love the look. Sorry Dom. I will send you one once I am finished. OK Jim. Give me a shout if I forget..
Quick question/comment regarding TREC pool inspection standards. 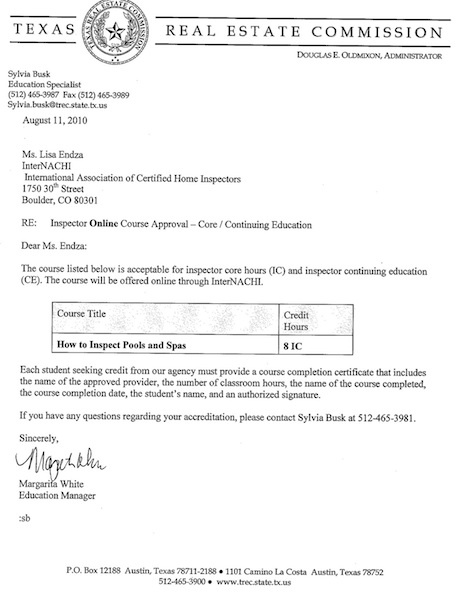 I noticed on the NACHI CE list that the Pool inspection exam is approved by TREC, however I happened to notice it is not listed on the approved CE courses list on the TREC website under the InterNACHI section. I heard through the grapevine that a CPO or CPI is required to inspect pools in Texas. So what is the true minimum requirement in Texas? Also, what is the best cert to have to mitigate lawsuits concerning pool inspections here in the great state? I am asking because I am just getting my feet wet in Texas inspections. Any help/comments are appreciated. I just presented a live course on pool inspections at the Florida conference last month. I'd love to work with you on a NachiTV episode or course. BTW: no offense but the nachi course is ready for a little updating, especially on energy issues. HIP has a decent template on their website, just check out the list of all templates it's near the top. You'll probably need to change some of the terminology to fit your area though. So what is the true minimum requirement in Texas? Of course following the minimum requirement is a good way to set oneself up for failure and a lawsuit in this line of work. For those who are currently performing pool inspections here in TX, is doing the CPO/CPI course the best method or is following a experience approach satisfactory? Then you know more than most. I can vouch that Larry did teach a good class! Thanks for all the courses, starting another one! Might as well add this to my list of ancillary services offered. Lot's of pools in SoCal. Minor typo, under the electrical section the ground is shown attached to the hot side of the outlet in the schematic for the GFI wiring. Could lead to confusion for some students. Are you referring to http://www.nachi.org/gallery/electrical/service/gfci-branch-circuit.jpg, which appears in the course?